How to write about this book for you here? Derrick Jensen fearlessly assesses the terrifying state of our world, for us as people and as not-the-only inhabitants of a globe that is sick with our presence and practices. It is difficult to write about what he has to say and my reactions to it; it’s very personal, because I and/or people I love may or may not be trying to follow some of Jensen’s teachings even as we speak. What I really want to say in this so-called “book review” is, go read Jensen now, and then do something about it. The concept of endgame is familiar to me from chess. The idea is that we’re trying to get to a final outcome of this chess match, trying to establish a winner and a loser, and there’s no sense hanging on to all these pieces and stretching things out. Instead, I will happily give up my bishops (knights, rooks, queen, all of ’em) in exchange for yours, in order to hurry up the desirable end of the game. 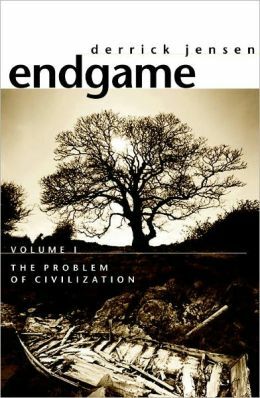 Endgame takes the same concept – a desirable hurrying of this game onto its inevitable finish – and applies it to our world, or rather, to civilization. He tells his reader why and how our civilization or culture is hopelessly, insanely f*cked up. He argues that we ARE headed for an end to civilization – and quite appropriately and desirably so – and that we should be hastening this end, the sooner that we can then begin living more sanely (if there’s any “we” left), and the healthier that the planet and anything left on it will be post-endgame. This may very well sounds nuts to you, if you haven’t given things like global warming, mass extinctions, water shortage, and worldwide social injustices much thought. But it might make a great deal of sense – especially if you let Derrick Jensen tell it, which I really recommend, as he does a far better job of it than I do. Perhaps my first surprise in reading Endgame is that there were no surprises. Jensen makes these arguments so incredibly articulately, cleverly, even funnily, and backs them up so solidly, that I am wowed; but nothing he had to say was entirely new or surprising to me (sadly). He does a really fabulous job of expressing clearly what I already knew, suspected or feared. He also presented some new angles that I hadn’t much considered; and he expands the scope and scale of our problems in a way that I appreciate and found thought-provoking. Make no mistake: Jensen is a philosopher, a thinker, a cerebral guy who has clearly done copious research and spent time talking with some of the smartest people out there. Would that we all had time to do this kind of research and thinking! (Since we don’t, read Endgame.) My father has noted that even climate change experts like Bill McKibben stop short of the dire predictions Jensen posits. I think considering these scary truths is useful, instructive, and constructive, even while it’s sad and terrifying. If you believe that we just need to drill for more oil; that those with lots of money have the right (and the duty) to protect what’s theirs; and that poor people in poor countries that still have some trees (oil, etc.) left should just move over for those of us that know better – Jensen is unlikely to convince you otherwise. He doesn’t really bother with you, in fact: you are not his audience. (“I was going to suggest those who think the U.S. invasion [of Iraq] has nothing to do with oil should put the book down, but realized they’ve probably already tired of the big words.”) And maybe that’s as it should be, too. Convincing those people is a big job – possibly an impossible one – and there’s other important work to be done. I don’t know that we should be wasting our Derrick Jensens on convincing the hardline fans of civilization that they’re wrong. Aside from the clearly central issue that I appreciate what he had to say, see the wisdom of his arguments, and applaud his articulations, I also really enjoy Jensen’s conversational style. He can somewhat ramble, but is abundantly coherent for all that; maybe it was just my deep interest and passion for what he was saying (I’m nodding and saying “yea, yea!” as I read), but it all flowed very well even while jumping around a little. Of course I must say too that I loved his love for parentheticals (he mentions how much this frustrates his editor!) because, can you tell, I share it. I believe it was on his website that I read that he completes each page (or several), completely, before moving on to the next: that is, when he’s writing page 11, pages 1-10 are done. I find this fascinating. (I’m always interested in the mechanics of my favorite writers.) And it allows for a journal-like feel: he’ll break off from an argument he’s making to tell an anecdote, like “tonight I gave a talk, and at the end a woman said…”, and the reader is right there in the present with him. He wrote that paragraph on the night that that woman said that thing. I want to lay them out as clearly as I can, for you to accept or reject. Part of the reason I want to do this is that the questions I’m exploring regarding civilization are the most important questions we as a culture and as individuals have ever been forced to face. I don’t want to cheat. I want to convince neither you nor me unfairly (nor, for that matter, do I want to convince either of us at all), but instead to help us both better understand what to do (or not do) and how to do it (or why not). This goal will be best served by as much transparency – and honesty – as I can muster. He then spends 450 pages proving his premises. I appreciate this clarity. Frankly, I was already on board with his assumptions, but agree wholeheartedly that this is far too important a problem to make assumptions about; the intellectual exercise of questioning our assumptions is absolutely necessary. I like that he is so reflective, asking questions he can’t answer, reconsidering. This is too important a moment for blustering false positivity. Therefore, even though I was willing to buy into premises like, “The culture as a whole and most of its members are insane. The culture is driven by a death urge, an urge to destroy life,” I still value having them proven to me. Jensen questions himself and his own motives. And that’s something I respect. A solid ‘A’ for style, then, but the real ‘eureka’ for his thoughts and arguments and philosophies. I can’t wait to read Volume II: what we’re going to do about it. Rating: take note: 10 salmon. …and a family of spotted owls for your fine review; well done! Now: our next assignment; knowing what we know, what to do when we get up in the morning? Yes, that is the hard part.